Hi Everyone, just a quick heads up, my Spring dates for my Specify Colour with Confidence events are up, we are going to Palm Springs, Toronto, Atlanta, Houston and New Jersey, register here. Back when I was a brand new designer, I always remember being in a home where the owner said she completely re-decorated her living room every seven years. And it rarely got used, so this was just something she did just because it was time for a change. Maybe the 7 year itch also applies to home decorating. It will be seven years this Spring since we have lived in this house and I’ve already got my eye on a few areas I’d like to refresh. And, as you saw here, I’ve already refreshed my kitchen (although having a blog where I constantly need content was definitely a big reason why I did it). 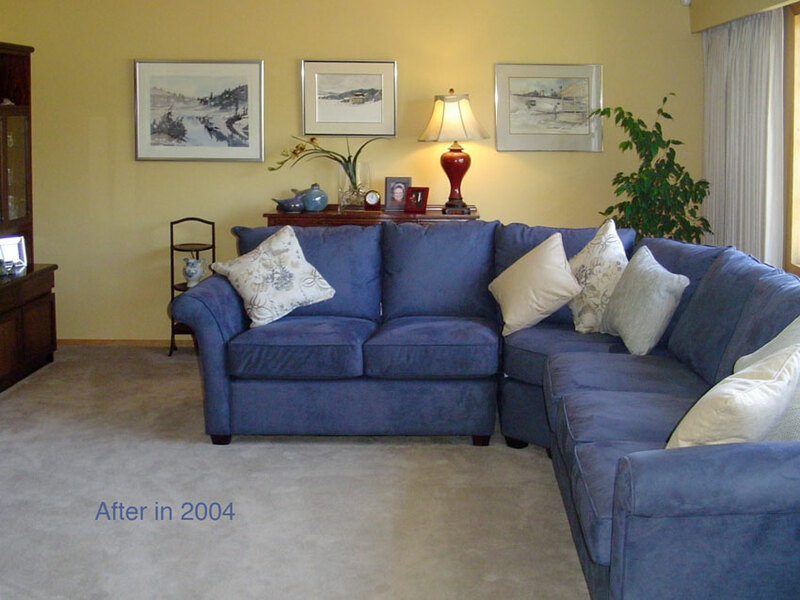 I was reminded of this story because earlier this year, I helped my long-time clients Bob and Lynette Best, with a living room re-fresh. I’ve worked on their living room twice before and the timing actually happens to land right at every seven years which I thought was interesting. The first time I helped them re-do their living room, I joked that their furniture looked like it was under arrest because their original sectional was positioned right in the corner of the room (cannot find that before pic unfortunately), and the rest of their furniture was sitting against the walls all around the house. I moved the sectional away from the wall (because we had lots of room) and placed an existing sideboard behind it so we could create a vignette that became the focal point of the room. When you walk into their entry, this room is the first space you see (below). I’ve also come a long way in the world of decorating and styling. Let’s go back in time and see what the first ‘after’ picture (in 2004) looked like shall we? We painted the room yellow and because they previously had a sectional, we chose another one in blue (not brown even though that was the current trendy neutral). Lynette and Bob have a big family so when they entertain, everyone is in this room. Lynette loves blues and they already had some lovely original artwork that we used. After the sectional was installed, they decided they wanted an ottoman instead of a coffee table which is why that space is empty for the first after photo (it was still on order and came later). I had not mastered the art of arranging pillows yet. So for the after photo, I stood them up on an angle. This was the artwork in the entry, so I chose a red and we painted an accent wall there and I repeated some red in the living room (above). Then in 2011, seven years later, Lynette called me to get some new pillows made, re-paint and refresh the accessories. It seems so obvious to me now, that I don’t understand how I could have missed this back then, but if I was going to bring red pillows into this room, I should have specified at least three of them. Plus the room technically needs more red if we were introducing such a strong colour in throw pillows, but it’s fun to see how we evolve as designers by looking back at older work isn’t it? I did love the paint colour I chose in here (BM Collingwood) which is a violet grey. Not blue, not green grey, just right. This colour doesn’t look violet unless it was sitting with green or blue (and the undertone should have been either of those two). Also back then, we were still photographing rooms with the lights on. We don’t do that anymore. This time (and now it’s been 14 years), Bob and Lynette wanted new furniture, their living room faces southwest, the upholstery had faded and just looked tired. They wondered if they should re-cover it, but since re-upholstering basically costs the same as buying new, I suggested a style that was more refined and would feel less casual than this one since this is also their formal living room. She said, “I still love the blue, so let’s do that again”. And this just makes my point, yet again. Colour is way more classic and timeless than the current, trendy neutral. Had we installed a brown sofa in 2004 when that colour was trendy, we would certainly not have done that a second time. Anyway, since 2011, they have retired and are taking lots of fabulous trips while they are still fit and fabulous! Lynette also confided that she didn’t want their house to look like they hadn’t touched it since they retired. I once spoke to a real estate agent who commented that often, a home still looks exactly the same as the era that the owners retired. Makes sense right? Re-decorating and continual updating of a home is certainly a luxury for many and money often gets tight after retirement. 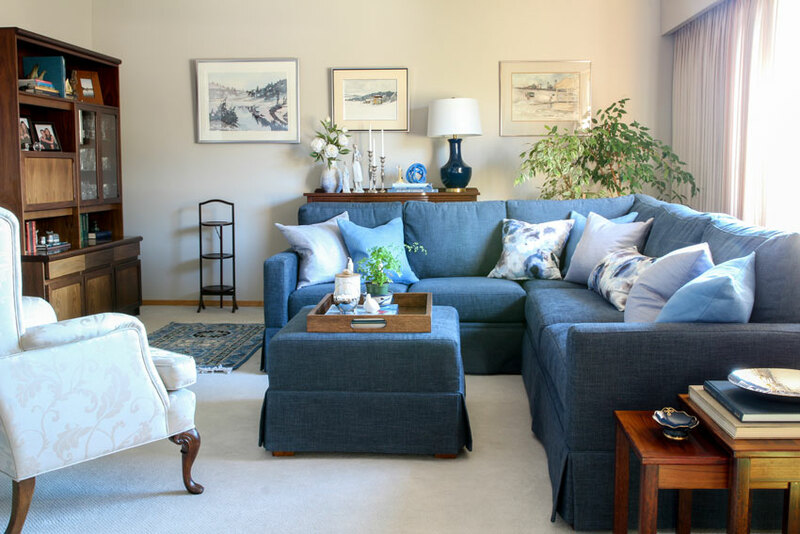 For this refresh, I thought it would be pretty to keep it in shades of blue and loved the cornflower blue in a throw rug they had placed on the left side of the sectional. I found the watery inspired pattern in the fabric with the blues and lavenders which is also repeated in the artwork, and this time, if I do say so myself, I have actually mastered the art of how many and which size pillows belong on a sectional. I’m also really happy with the more sophisticated feel of this sectional, the skirted bottom helps reinforce that look. And the straight arms make it feel so much more tailored and modern. Sectionals are built for comfort, but that doesn’t mean the details can’t be refined. Lynette was a nurse, so I placed her figurines front and centre along with a cornflower blue decorative knot and vase, and a navy blue lamp that feels fresh and current (below). When I was first learning how to specify throw pillows, I would specify medium and large pillows, but I have learned that is not necessary. They can all be the same size, except for the longer one which sits on the longer side of the sectional (in this case). So don’t underestimate the power of a throw pillow. I have worked many years to get pillows to look right on a sofa! I love my clients for sticking with me as I grew as a designer. Decorating using colour is definitely a skill that improves over time if you are committed! PS. 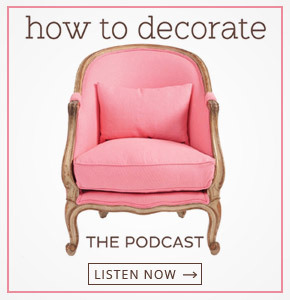 Check out my podcast interview with Nick May with The Chaise Lounge! Nick owns a painting company in Portland and he uses strictly True Colour Experts for his painting projects because his projects include a colour consultation so that his clients love their colours! 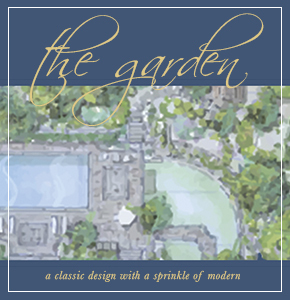 Related post: Ask Maria: What is the Most Timeless Colour? I love seeing how you progressed through your career and the refresh looks beautiful! Your styling is just what the room needed. I have gotten SO sick of my living room just this past summer. It was really fun seeing the changes over the years, and so interesting about the 7 year thing. I think it might actually be a thing! Interesting that the paint changes, the sofa changed as did the pillows, but the draperies appear to be the same over the years! Enjoyed seeing the changes! How great to see these photos from the different years! Love the new sectional style. That blue is beautiful and timeless…and that is a great formula for sectional pillow arrangement. 🙂 Thanks! Fun post Maria. I have to laugh at the pillow specs however since my kids would outright rebel. For some reason my family immediately removes my perfectly placed pillows and tosses them onto the floor thus freeing up space to sit right up in the corners of the sofa. And of course the pillows don’t find their way back up off the floor. After years of battling this I have decided to give up, defeated, they won the battle. I now have one solitary, lonely pillow that tries everyday to escape getting the floor toss. I have the same type of history. Even guests move and complain about pillows. I’ve decided to go with far fewer pillows for a sleeker fresher look and this time tried to find a couch that looked fine without them. I’ll even do a great throw rather than pillows. Using Maria’s great color and design tips to add pizazz with a few (or no) well chosen pillows and then use color and texture throughout the room. You must live at my house. I have the same problem. Thank you for this very timely lesson as I have just bought my first ever sectional and had no idea how to style it. Maria, thanks for showing how the room as evolved. That was quite instructional. I also love seeing that its ok to put a piece taller than the sofa behind it. I have a table I wanted to put behind my sectional, but it was just a tad taller so I didn’t do it and just have this stupid empty space. But now I’m going to try again and make a cute little vignette like you did. Thank you. It looks great! Did I miss the newly updated paint color? I scrolled through to see if it listed but did not find the paint name. If I missed it, I apologize! I’m curious about why you hung the art on the walls but left space for the lamp as though it was art on the wall…What’s your thought about this? Why wouldn’t you treat the lamp as an accessory and not a fixture? Thanks. “Lumbar” (v. Lumber) … thought you’d like to correct it! Love that you left examples of pillow dimensions! I sew my own pillows and change them around with the seasons and where my emotional depth takes me- something light vs. something with more depth. I still have trouble getting just enough stuffing to make them comfortable, yet not look wimpy. Can purchase some real quality fabrics that are perfect at a comparable price to buy ready made, but would love input from others who sew pillows about the amount of stuffing to use for some of the dimensions you suggested- or any thoughts on such. I make my own pillows also. I find that inserts work better than stuffing. And I use an insert that’s an inch or two larger than the cover. And I always use down-filled inserts. Never foam. That’s how I get a nice full look. I hope that helps. I still love my living room, but after five years I did a complete furniture rearrangement and love it even more. It looks super cozy, which in this climate is a huge plus. I wish I could arrange the chairs with perfect symmetry, but my husband fusses and is always pushing his chair back too far! Oh well. Perhaps in another couple of years I’ll be ready for a refresh. Your skill development is interesting to see—thanks for showing us the results of your ever-mounting thousands of hours of experience. I notice too from the pics you post how your personal style has evolved. It’s now quite sophisticated. You look better all the time! Can I talk about the ficus in the corner? We have one as old as our marriage – 32 years. I’ve tried to kill it several times (the ficus, not the marriage.) When our oldest was born it dehydrated in a corner. Once in Georgia it got caught outside in a frost and I wrote it off and threw it down our deep ravine. Every time hubby watered it outside and brought it back. When I bought it, it was small enough to put in a full grocery cart. At its largest, movers had to be talked into loading it. It has lived in four states with us. I had to chuckle in recognition when I saw this one in all the photos. Maria your styling in the present room is very sophisticated! The shades of blue makes the room look cohesive! Love it! What I love about this business is that you never stop learning and growing! There is always something new and exciting to absorb. I am also a pillow geek and I find that is one way to change the look of a room! If I could just get across to my clients that as someone said “You need to get all your ingredients together before you can bake a cake ” Another great post! I had to chuckle when I saw the pillows standing up at an angle. You’d be surprised how often I still see that type of arrangement at hotels. Obviously I’m not staying at high-end hotels. Nice job, Maria! I think having a blue sofa would make it easy to find pillow fabrics. Everything goes with blue! Can I please ask how much room is behind the sofa? Great post! I learned so much. Would you explain why design photos are best taken with lamps off? Thanks. Great refresh, thanks for sharing! Love the sectional, the lamp with the blue base and the 2 nesting tables right foreground. Do you have a source for those tables? Thanks. Excellent! Love the three photos over the years. So nice to see a realistic refresh instead of only brand new high-end rooms. Love your blog! When this post appeared, I was awaiting my new sofa. It arrived today – sapphire blue – and boy does it need pillows! I have always believed in the power of pillows, but I never owned a sectional couch (or one that wasn’t white) before so having your formula will be great!!! I am adjusting to the sight of a huge swath of blue in my living room, but it sure makes a statement. I will let you know how it all works out! PS – ordered sofa online so this whole venture was WAY out of my comfort zone!